• Do you survive boring classes or meetings by imagining your favorite TV couple making out? • Have you posted a lengthy diatribe on the Internet defending a fictional character? • Have you gotten carsick from reading fan fiction on your smartphone? • Has Netflix presented you with the “Are you still watching?” button at least once? Fangirling is more than a hobby; it’s a way of life for an enormous community. As a fangirl, you are a passionate, intelligent, and creative creature. But sometimes focusing on the fictional can keep you from putting those qualities to use in your everyday life. Rather than using your pop culture obsessions to avoid your real-life problems, you can tackle issues like stress, anxiety, and low self-esteem by turning obsession into inspiration. 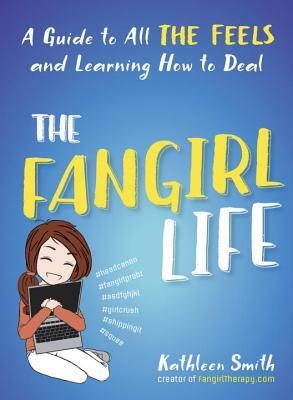 If you’re ready to start translating those fictional obsessions into some bold personal moves, let The Fangirl Life help you become your own ultimate fangirl. KATHLEEN SMITH is a licensed therapist and also runs the website FangirlTherapy.com, where she answers questions submitted by fangirls struggling with their obsessions. When she’s not crying about her own OTPs, she writes for popular websites such as Slate, Huffington Post, Salon, Lifehacker, HelloGiggles, Bustle, and Forever Young Adult. She would never turn down a badge to Comic Con. In this witty and sympathetic debut, therapist Smith—a self-proclaimed fangirl and proprietor of the blog Fangirl Therapy—offers wise advice on being a devout but well-rounded fan and even turning obsession into inspiration for one's own life. Using helpful exercises, Smith seeks to empower fellow fangirls to become women who will stand firmly behind their thoughts and actions, deal constructively with conflict, and use the books and people they admire to create their life stories. A particularly inspired tactic is reframing mistakes and missteps as "plot development." Smith points out that avid writers of fan fiction can channel that creativity into a full-time job writing original fiction. She also turns normally intimidating therapy-speak on its head in a chapter entitled "All the Feels," describing such made-up diagnoses as obsessive imagination disorder and preseason anxiety disorder. While the adolescent tone can occasionally be a bit cloying, the author pulls it off by weaving in snippets of her own most embarrassing—and transforming—fangirl moments.